Solve this viral flower puzzle image! 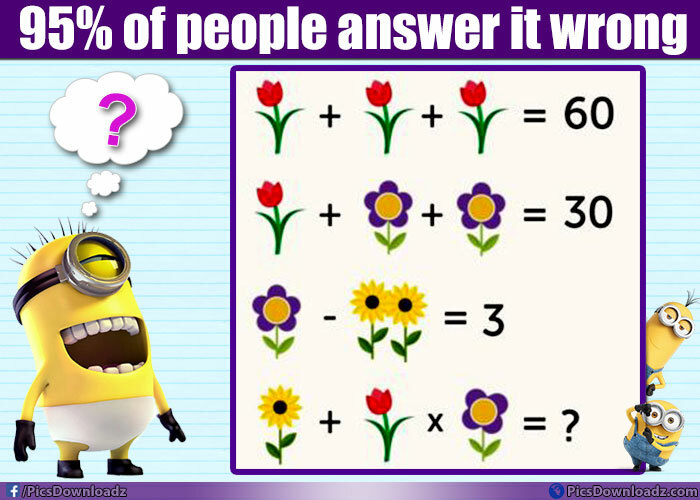 The viral flower math puzzle image with correct answers and solution! Only for genius puzzles! Hello, This one is most popular puzzle image over the internet, knows as flower puzzle. Solve this tricky or confusing brainteasers puzzle and share your answer via comments. All you have to do, just find the values of these flowers and put into the last equation and find the answer. Simple right? ⇒ Yellow + Red × Blue = ?? No need to be in hurry take your time. Check the details of the puzzle and try to solve the puzzle. Don’t forget to comment before checking the answer! The answer is given at the end of the post. Y + R × B = ? Y + R × B = ? ⇒ 1 + 20 × 5 (Do multiplication first) ⇒ 1 + 100 ⇒ 101 Ans. Hoory! Did you get the same answer? or we are missing something? YES! we are missing something, if we compare the blue flower of 2nd & 3rd equation with the 4th equation, we will find the difference. Flower Puzzles Image, Math Puzzles Image with Answer, Brain Teasers Puzzles Image, Only for Genius Puzzles, Logic Puzzles Pictures, Difficult Puzzle Image, Confusing Math Puzzles, Picture Puzzles with answers, Math Question Image, Maths Puzzle Images, Maths Picture Puzzles, Only for Geniuses Answer, Puzzles for Facebook, Puzzles for Whatsapp, Only for Geniuses, Math Question Image, Math Puzzle Images, Maths Picture Puzzles, Genius Puzzles, Math Game, Solve this if you are a Genius, Viral Puzzles.